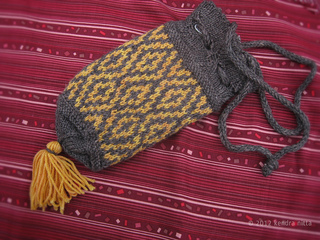 This great little bag for stowing away treasures is worked seamlessly in a traditional lozenge shape, and features the Cross and Diamond mosaic pattern from Charted Knitting Designs by Barbara G. Walker, worked stranded rather than slip-stitched. 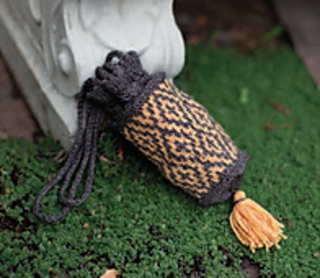 Other than the I-cord handles and tassel, there is virtually no finishing, making this reticule a wonderful quick gift or special indulgence for yourself. The bag hangs best if the handles are pulled from the inside rather than the outside. 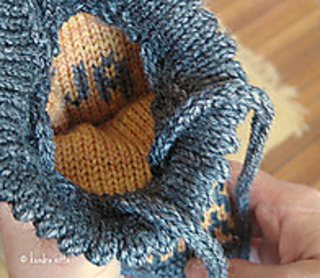 Vary the length by pulling up more or fewer loops. 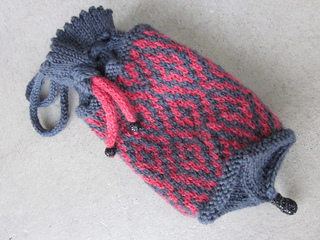 Add you own duplicate-stitch monogram to the inside, and use it as an evening bag, or every day as a media cozy. 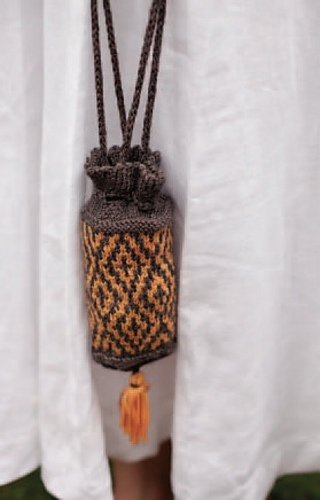 This piece was inspired by Mrs. Elton’s reticule in Emma.